After a mixed to down first quarter the Dow Jones index and US stocks are back on the rise. 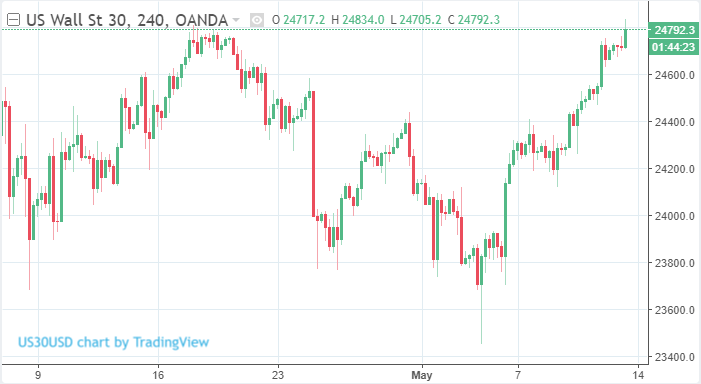 The Dow Jones price has gained over 1000 points since the low in early May, and is now sitting exactly at the April highs as the middle of the month passes. The US Dollar finally gave up pushing for a new high in Europe trading session which in turn gave stocks a boost on the opening bell. Thursday was a positive day for investors with economic data suggesting that the US labour market is in good shape. Inflation data came in weaker than forecast and static unemployment claims both good indications of the state of play across the United States. Jobless claims remained at 211,000 for the second week in a row which helps keep overall numbers near the 49 year low. This prompted a positive close on US stock indexes with the Dow Jones up 0.8% and the Nasdaq up 1.02%. This positivity has held ground into Fridays early trading with the Dow Jones pushing above (albeit slightly) the April highs of 24800. There is a slight bit of resistance at the 25000 mark, which underlined the lows of early and mid March. However, continued Dollar weakness could help the cause for higher stock prices over the coming weeks. The US Dollar has been showing incredible strength for the last month but may have topped out for the meantime after hitting the resistance of the underside of the November 2017 lows. If the Dollar continues behaving as it has for this last year, then a retrace is normally the pattern after hitting a strong support or resistance level. It could now look for some support below and find a comfortable trading range for the summer months when volume naturally drops off from most currency pairs.